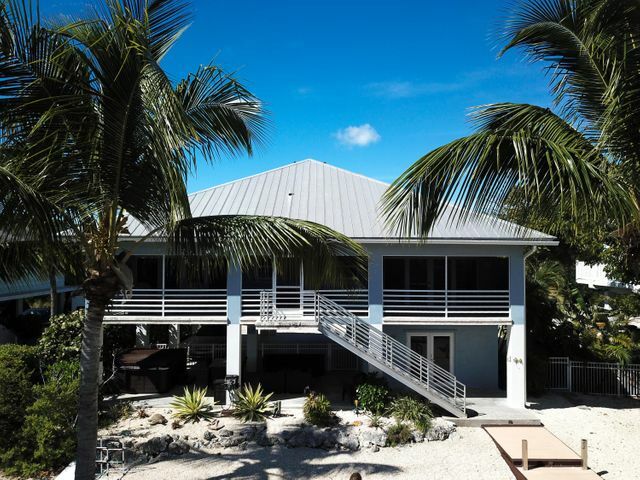 A waterfront Key Largo home to make your every wish come true! Privacy and views over the wide open boat basin. Solid CBS construction with a metal hip style roof, Impact glass windows and doors, auto gated entry & huge back yard, 40 foot dock with a 15, 000 Lb boat elevator plus a floating dock for up to a 21 ft boat. Fast bay and ocean access. Vaulted ceilings, European imported tiles throughout , updated kitchen, white cabinetry, stainless appliances Samsung 4 door fridge, wine cooler, and a custom sit up bar with quartz counter tops, Over sized Master bedroom and bathroom with views, en-suite baths in every bedroom. large under-story parking area plus a huge enclosed, fully permitted storage/garage with a permitted cabana bath. Nature preserve across the street, one hour to Miami.